GEORGE STEPHANOPOULOS: Thanks for joining us live on ABCNews.com and Yahoo.com for this exclusive interview with President Barack Obama and thanks for having us to the White House. GEORGE STEPHANOPOULOS: There has been a huge response since we announced this interview. 40,000 questions have come in. As you might imagine, most on the economy. And a lot of anger out there. There's so many people who simply don't think they're better off than they were four years ago. How do you convince them that they are? PRESIDENT OBAMA: Well, I don't think they're better off than they were four years ago. They're not better off than they were before Lehman's collapse, before the financial crisis-- before this extraordinary recession we're going through. I think that-- what we've seen is that we've been able to make steady progress to stabilize the economy. But the unemployment rate is still way too high. And that's why it's so critical for us to make sure that we are taking every action we can take to put people back to work. And the American Jobs Act, the bill that I put before Congress three weeks ago puts construction workers back to work rebuilding our roads and bridges, it puts teachers back in the classroom, teaching our kids, makes sure that veterans-- are getting a break-- if they come home and are looking for a job with a small business, provides everybody a tax cut, small businesses and middle class families alike so that we've got more consumers out there with a little more confidence, a little more money in their pockets. You know, these are ideas that historically have been supported by Democrats and Republicans. GEORGE STEPHANOPOULOS: As you might have heard in the last hour, the Republican leader in the house, Eric Cantor, said he's not going to schedule a clean bill-- this all or nothing approach, he said, is unreasonable. PRESIDENT OBAMA: Well, look, what he needs to do is to tell us what exactly he's for. Because what I've done is put forward what economists say can increase our growth by close to two percent and put 1.9 million people-- ultimately back to work. Now if he's got other ideas, we're happy to look at those other ideas. But what-- what I think the American people cannot abide by is us doing nothing. We can't sit here and pretend that somehow-- you know, Washington just cutting spending, in and of itself, is going to be putting people back to work. GEORGE STEPHANOPOULOS: ...pass the tax cuts and the trade bills, is that enough? PRESIDENT OBAMA: Well, we're going to be passing the trade bills. And I'm pleased we're doing that. Because that actually will add jobs-- you know, the trade bill not only is for Korea, but also Panama and Colombia. All these countries, right now, are able to sell into the United States. We have one of the most open markets in the world. Theirs are still a little too closed. And as I've said before, I want-- I don't mind Kias and Hyundais sold here, as long as Chryslers and-- and Fords are being sold-- in Korea, as well. So I'm glad that's an area of bipartisan agreement, but it's not enough by itself. There's more that we can do. And, you know, for example, you talk to Republican governors, Republican mayors, and they'll tell you that the need for them to rebuild roads and bridges, including some-- you know, that-- I visited in-- in-- in Virginia, but also-- some that I've visited-- between Kentucky and Ohio, where-- both-- Mr. Boehner and Mr. McConnell hail from-- those are projects that need to happen anyway. Why not do them now at a time when we've got construction workers out of work, contractors-- are able to come in under budget, on time. This is the time to do it. GEORGE STEPHANOPOULOS: We have a brand new poll out at ABC. It's just coming out-- later today, showing the majority of Americans, 55 percent, think you'll be a one-term president. Are you the underdog now? GEORGE STEPHANOPOULOS: You embraced that pretty quickly. PRESIDENT OBAMA: You-- you-- you know, I-- I don't mind. I-- I'm used to being an underdog. And-- and I think that-- at the end of the day, though, what people are going to say is, "Who's got a vision for the future? That can actually help ordinary families recapture that American dream?" When I ran in 2008, the basic idea was that-- you know, ordinary folks, who are working hard, you know, doing everything right, just weren't getting ahead. Wages, incomes had flat-lined, costs were going up, everything from health care to college education. And-- you know, the whole approach of everything I've tried to do over the last three years is to say, "What are those big changes that we have to make so that our kids are getting the best education, we've got the best infrastructure in the world, we've got the tools that allow us to succeed again?" GEORGE STEPHANOPOULOS: We actually got a great question on Twitter about 2008. It's from Gale Glover, and he asks, "If hope and change define the 2008 campaign, what two words are going to make-- are going to define 2012?" PRESIDENT OBAMA: I-- you know, I haven't quite boiled it down to a bumper sticker yet. But I think what'll-- define 2012 is-- you know, our vision for the future. That's three words. Four. GEORGE STEPHANOPOULOS: It's five, actually. PRESIDENT OBAMA: ...Vision for the future. Four. There is-- going to be a contest of values and-- and vision in 2012. Nobody's going to deny that we're not where we need to be. That the economy is not producing enough jobs that pay well and give people-- a leg up on life. And so the question is, "What's most likely to get us there?" Now there are going to be some folks who make the argument that if you just slash spending, eliminate regulations that prevent us from polluting our air or polluting our water or, you know, we bust labor unions, that that in and of itself is going to restore the American dream. I don't think most Americans believe that. I think they understand that we've got to invest in making sure we've got the best education system possible, that we've got to invest in basic research. That part of what made us an economic superpower was we had the best technology, the best infrastructure, and that government has some role to play in that. And so the question's going to be-- you know, which vision is more persuasive to the American people? GEORGE STEPHANOPOULOS: One of your potential opponents, Chris Christie, governor of New Jersey, very tough speech at the Reagan Library last week. He said-- you don't have the courage to lead. He called you a bystander in the Oval Office. And I want to get this right, because it-- what he ended up saying is that-- you haven't brought people together. Now you're going to divide them. And he asked, "What happened to State Senator Obama? When did he decide to become one of the dividers he spoke of so eloquently in 2004?" GEORGE STEPHANOPOULOS: --he basically says he did in New Jersey, brought people together, which you haven't been able to do in Washington. PRESIDENT OBAMA: --the-- well, the-- you know, the way it's going to change is because the American people are gonna have the say about where we want to go, you know? They're going to have a decision to make. And they're going to say to themselves, "You know what? President Obama wanted to reduce the deficit by not only cutting spending, as he's already done, but also by making sure that-- the most fortunate in our society are paying their fair share. That we're closing corporate loopholes that small businesses don't get. The Republicans have said no to that." Well, that's a contrast in approaches. And-- you know, when you tick down which approach the American people generally prefer, they'll say mine. Now what they'll say is, "He hasn't been able to get it through Congress." And, you know, I-- I'm the first one to acknowledge that-- the relations between myself and-- the Republican Congress have not been good over the last several months, but it's not for a lack of effort. It has to do with the fact that-- you know, they've made a decision to follow-- what is a pretty-- extreme approach to governance. GEORGE STEPHANOPOULOS: You might have a new issue on your plate over the weekend. Bank of America now is doing a $5 service fee for using your debit cards. Drawing-- a lot of outrage, a lot of questions. And basically the questions boil down to what Vikki Manko of Naperville, Illinois asks. "These are the types of things government should get involved in and put a stop to." Can you put a stop to that? PRESIDENT OBAMA: Well-- what we did was we put a stop through-- The Financial Reform Act of them charging fees-- for credit cards. PRESIDENT OBAMA: And so-- Well-- what-- what the banks are saying is-- that "Rather than take a little bit less of a profit. Rather than paying multimillion dollar bonuses. Let's treat our customers right." And this is exactly why we need this consumer finance-- protection bureau that we set up that is ready to go. And what we need is a confirmation of the person I've appointed, Rich Cordray treasurer of Ohio. Back in Ohio, Republicans and Democrats both think he's terrific and he's fair. But this is exactly why we need somebody who's sole job it is to prevent this kind of stuff from happening. GEORGE STEPHANOPOULOS: Can you stop this service charge? PRESIDENT OBAMA: Well, you can stop it because it-- if you-- if you say to the banks, "You don't have some inherent right just to-- you know, get a certain amount of profit. If your customers-- are being mistreated. That you have to treat them fairly and transparently." And-- and my hope is is that you're going to see a bunch of-- the banks, who say to themselves, "You know what? This is actually not good business practice." Banks can make money. They can succeed, the old-fashioned way, by earning it. By lending to small businesses. By lending to consumers. By making sure that-- you know, we are building the economy together. But-- you know, without the kinds of protections that we're starting to see the Republicans try to roll back-- we're going to continue to have these kinds of problems. And this is exactly-- the sort of stuff that folks are frustrated by. This, by the way, is an example of the-- the contrasting visions that we have. If-- if-- if-- the Republican Party believes that we should do nothing to curb abuses on Wall Street and roll back regulations put in place to prevent the next big financial crisis, well, I've got a big difference with them. And I think the American people are going to be on my side on that. GEORGE STEPHANOPOULOS: Your White House has faced a lot of questions on Solyndra, the-- solar panel company you paid a visit to back in 2010. You really held it up then as a model for jobs and clean energy. Do you regret that? PRESIDENT OBAMA: No, I don't, because if you look at the overall portfolio of loan guarantees that have been provided-- overall, it's doing well. And what we always understood was that not every single business is going to succeed in clean energy. But if we want to compete with China, which is pouring hundreds of billions of dollars into this space. If we want to compete with other countries that are heavily subsidizing the industries of the future, we've got to make sure that our guys here in the United States of America at least have a shot. Now there are gonna be some failures, and Solyndra's an example. GEORGE STEPHANOPOULOS: --getting warnings not to back that company up, not to visit. PRESIDENT OBAMA: Well-- you know, it-- hindsight is always 20/20. It went through the regular review process. And people felt like this was a good bet. But the fact of the matter is-- is that if we don't get behind clean energy, if we don't get behind advanced battery manufacturing, if we're not the ones who are creating the cars of the future, then we're not going to be able to make stuff here in the United States of America. And one of the most important things that I want to do over the next several years is restore a sense that America can manufacture, but we don't just purchase stuff from someplace else, but we're also exporting to other countries. GEORGE STEPHANOPOULOS: Let me ask you about Al Qaeda-- following the killing on Friday of Anwar Awlaki. Back in July-- Secretary of Defense Leon Panetta said that the strategic defeat of Al Qaeda is within reach. This as we approach the tenth anniversary of the invasion of Afghanistan. How close are we to that strategic defeat? GEORGE STEPHANOPOULOS: --attack on our homeland? PRESIDENT OBAMA: Well-- you know, I think that-- given the nature of our open society, we're always going to be vulnerable-- to the possible terrorist attack. But for them to be able to mount something that is a big project with a lot of financing, that is very difficult for them to do now. They're still dangerous. They're still our number one enemy. We've got to make sure that we-- don't let up. But I think that we are in a position where over the next couple of years, if we stay on it, that-- it's gonna be very difficult for them to mount the kinds of spectacular attacks-- that we saw on 9/11. GEORGE STEPHANOPOULOS: You gave a pretty passionate speech at the Human Rights Campaign fund Saturday night. And said that every single American deserves to be treated equally in the eyes of the law. Is that possible without legal gay marriage? PRESIDENT OBAMA: Well, I-- you know, I think that it is certainly possible for us to make sure that-- not only can they serve in our military, but we fully support them. That-- hospital visitation is available-- to gay and lesbian partners. That they're not discriminated-- against on the job. Being gay or lesbian is not a fireable offense. That at minimum, that gays and lesbians have strong civil unions that provide the same kinds of protections. GEORGE STEPHANOPOULOS: So you've said your position is evolving. You said you're struggling with it. What more do you need to know? 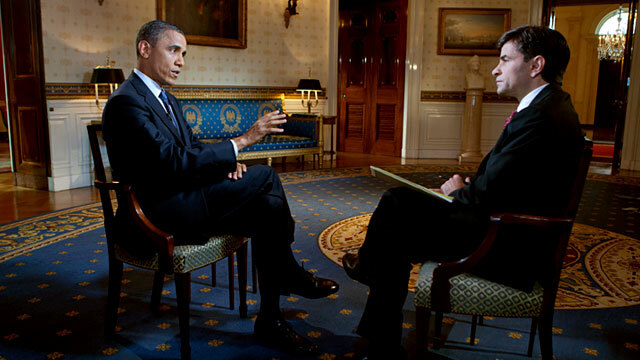 PRESIDENT OBAMA: Well-- you know-- I probably won't-- make news right now, George. But I-- I think that there's no doubt that-- as I see-- friends, families-- children of gay couples-- who are thriving-- you know, that-- that has an impact on how I think about these issues. It's also one of the reasons that I made the decision for us not to defend-- The Defense of Marriage Act, which-- I believe violated the Constitution. And, you know, is going to be-- decided in the courts probably-- in the next-- next few terms. GEORGE STEPHANOPOULOS: You think you'll change your mind before the election? PRESIDENT OBAMA: You know-- I-- I'm-- I'm-- still working on it. GEORGE STEPHANOPOULOS: And you're not going to tell it's how long it's going to take? (LAUGH) Let me just finish up with a couple personal questions. We got a lot of those-- on Yahoo, as well. A lot of people want to know-- first of all, I should say happy anniversary. PRESIDENT OBAMA: Thank you so much. 19 years. GEORGE STEPHANOPOULOS: 19 years. And they want to know what is the best single piece of advice Michelle has given you? PRESIDENT OBAMA: You know, that when all is said and done-- the mark of success is do you have children who are happy and healthy and-- able to go out there and function as responsible-- loving people. And-- so far so good. You know, I-- I think in-- in this business-- as is true for a lot of professionals, I think-- you love your kids, but you always got these distractions and they're always-- things tugging at you. And Michelle very early on-- being that anchor that says, "No, no, you know, if we've got-- a parent/teacher conference--"
GEORGE STEPHANOPOULOS: You're gonna be there. PRESIDENT OBAMA: "--we're gonna be there." At soccer games. You know, Sasha may say it doesn't matter, but it does. That steady drumbeat-- from Michelle-- was exactly right. And-- it-- it's-- it's part of the reason why, I think-- not only are the kids doing well, but-- it-- it provides me-- just a constant source of joy and-- and sustenance. GEORGE STEPHANOPOULOS: Four years is a long time in kids' years. GEORGE STEPHANOPOULOS: They were pretty little during the-- the last campaign. How do you protect them? This time around, when everybody's saying all these bad things about you? PRESIDENT OBAMA: You know, so far so good. I mean, partly because-- they don't watch-- they don't watch news. Although, the-- you know, they're starting to read. GEORGE STEPHANOPOULOS: On the internet, right? GEORGE STEPHANOPOULOS: They don't have to answer them. PRESIDENT OBAMA: They-- they-- they don't-- they don't-- they know who their daddy is. And-- and they're not worried about that. The thing I do worry about is trying to figure out that balance of making sure they've got space to make mistakes, be teenagers, et cetera. But obviously, they're not-- typical-- in some ways. So they're still having sleepovers. And they're still going to the mall. And they're still going to movies. But they've got this guy with a gun following them around! And-- and-- and so just-- just trying to make sure that that space is maintained. We've been able to do it so far. Our secret service detail is terrific about it. But it-- it's a balance that has to be struck. GEORGE STEPHANOPOULOS: Finally, since we are on the web here-- live on Yahoo.com, everyone wants to know which-- websites do you surf? PRESIDENT OBAMA: You know, I'm pretty eclectic. You know, I'll-- you know, I read a lot of newspapers that I used to read in print, I now read on-- on the web. GEORGE STEPHANOPOULOS: Oh, that's pretty cool. PRESIDENT OBAMA: Yeah, it was cool. I got it directly from him. And-- you know, I go to ABCNews.com, of course, and Yahoo. GEORGE STEPHANOPOULOS: And Yahoo, too, thank you. GEORGE STEPHANOPOULOS: --make a comment. PRESIDENT OBAMA: I-- you know-- I don't. I-- I figure if I-- if I got started-- I wouldn't stop. And I've got other things to do. GEORGE STEPHANOPOULOS: Mr. President, thanks for your time. PRESIDENT OBAMA: I appreciate it. Thank you so much. GEORGE STEPHANOPOULOS: And thanks to all of you for joining us on Yahoo.com and ABCNews.com. If you missed any of it, you can get it any time on either website. Take care.